Boye Creative Group LLC | Customer Appreciation Done Right! Happy Independence Day 2015! Can Ibuprofen Triple Your Risk of Stroke? As business owners, we are nothing without our customers. As customers, we like to know we are appreciated by the businesses we patronize. 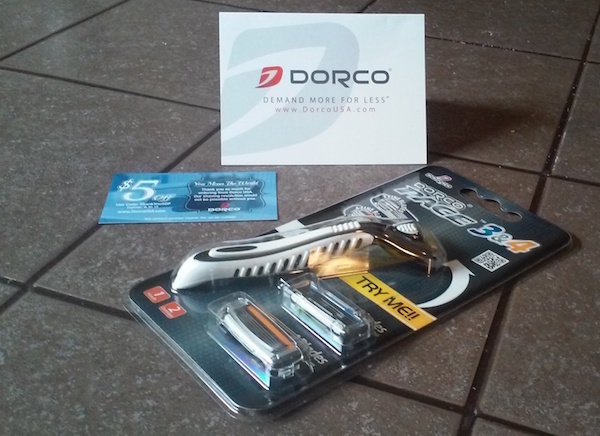 Here is a great example of a Customer Appreciation Package I received from Dorco, my favorite online razor retailer. The package includes a brand new razor handle, two disposable razor cartridges of different styles, a $5 Off Dorco Coupon, and a Corporate Greeting Card with a handwritten message inside thanking me for my business. Since Dorco already knows I ordered at least one razor from them in the past, they couldn’t possibly think I might want to use both my existing razor and the gift razor at the same time (wow, that would be dangerous). So, they must have figured I would either stop using the old razor in favor of the new one or, more likely, that I would re-gift the new razor to a friend or relative—while singing the praises of my razor company. That way, if all goes well, Dorco will have created a new customer for their disposable razor cartridges. Smart folks—they didn’t even have to purchase a mailing list. I must admit that the Dorco coupon could not have come at a better time—I had been meaning to place an order for more replacement cartridges anyway. However, with a quick internet search, I found even greater savings with a 25% Off Dorco Coupon Code—saving me an extra couple of bucks. Therefore, although I appreciated the hardcopy coupon, I never did use it. But, how many people searched for a coupon code like I did? Many of Dorco’s customers probably noticed the coupon’s expiration date was a week away and rushed to place their online orders. In our age of digital communications, too little time is spent handwriting letters (if you don’t believe me, just ask the post office). And, while we at Boye Creative Group are huge proponents of email marketing (hint … hint), it’s nice to receive something handwritten from time to time. There is also something to be said for hardcopy marketing pieces—custom-designed greeting cards, brochures, sales slicks, coupons, certificates, etc. The feel of the paper, its thickness, its scent (don’t laugh—some people smell everything), the vibrancy of its colors, and the fact that you actually possess it—all of these tangible qualities contribute to the perceived legitimacy of your business or organization. Need Help Designing a Customer Appreciation Campaign for Your Business? Schedule an Appointment with Boye Creative Group!